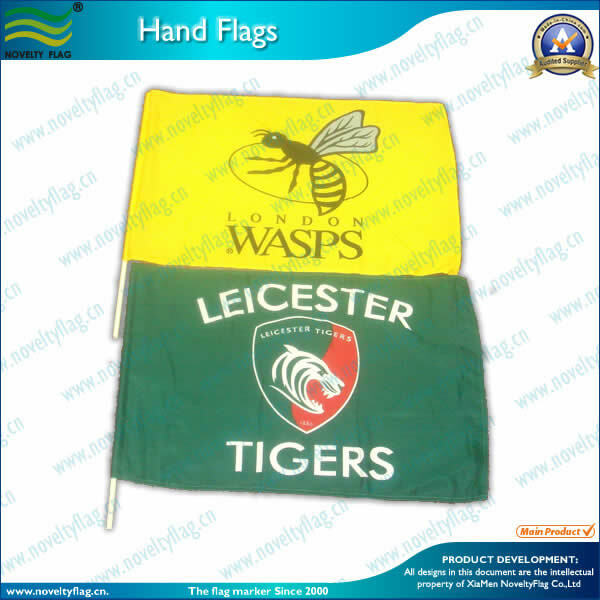 Hand flags can be all different sizes and we can make any size flag into an hand flag. We will give you the most common sizes for hand flags and you can decide if you need that size or something different. Hand flags are custom printed and via digital print or screen print . The hand flags we make are made usually single sided having the image on the other side in reverse as these flags are small and is not necessary for double sided, although if you need the hand flags to be double sided then we can do that. Hand flags come with poles: below are the size of the poles. Other size flags can be hand flags please ask when quoting. Hand flags are great for sporting clubs and promo events but can be made for any type of event or function.